USA Made Wood Stair Plugs, Premium Face Grain (AKA Side Grain) in Maple, Oak, Cherry, Walnut and More. 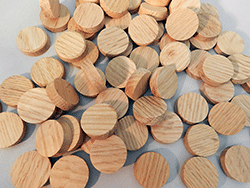 Designed for stairs, and to blend in with the surrounding hardwood, face grain plugs are premium quality. 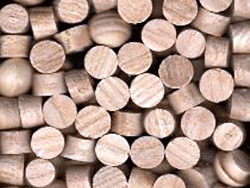 Choose Bear Woods for the best selection of hardwood plugs. 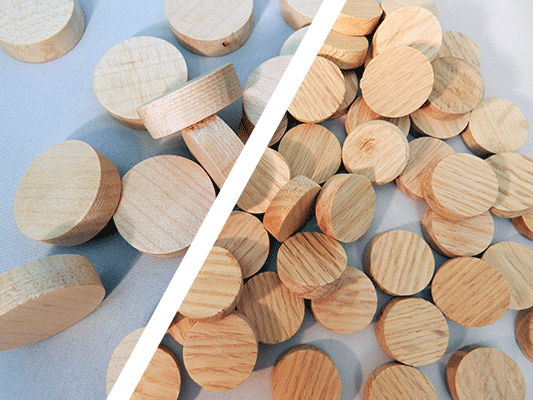 Side grain wood plugs disappear with your installation, or as a contrast with other wood species for a long-lasting, secure fit. 5/16" thickness up to 1-1/2" diameter with slightly tapered sides. 1) Browse by wood species, then by size. 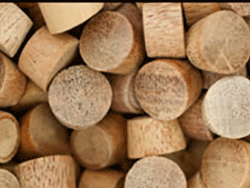 Within each wood species, fastest shipping available on side grain wood plugs sold in bags of 100. 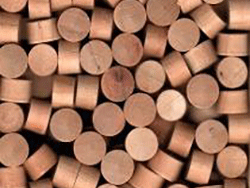 2) USA Made Wood Floor Plugs Available in Maple, Oak, Ash, Cherry, Walnut, Mahogany, Beech and Poplar. 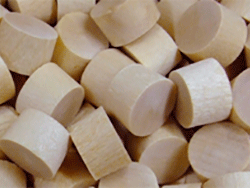 4) Wood Plugs listed as "Per Thousand" typically require a minimum purchase of 5000 plugs if they need to be made to order at our mill - but we usually have lots ready to ship, so please order what your require and we'll do our best to keep to your desired quantity, or contact you with options. 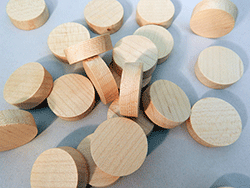 We also supply Mushroom Button Plugs, Floor Plugs and Flat head plugs with both End Grain and Side Grain. 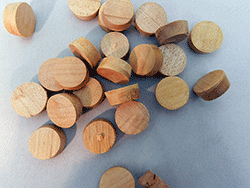 - View our entire selection of Wood Plugs.